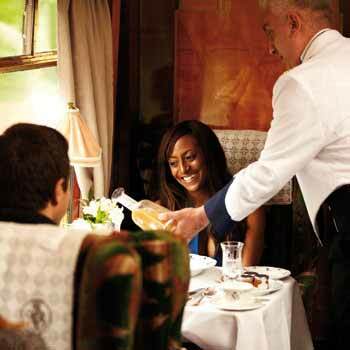 on the fabulous,luxurious British Pullman, sister to the famous Orient Express. As the cold weather sets in and we’re looking forward to another White Christmas, some of us start to look for indoor experiences where we can have all the fun and excitement but without getting wrapped up in our thermals and skiwear. Too much to ask for? Think again! Murder mystery experiences where you play the part of your own Miss Marple or Hercule Poirot (the famous Belgian, and NO, he’s not French) and join in with your fellow guests to find out Whodunnit, have long been a popular feature with our readers. But our favourite murder puzzle, and the one we’re recommending this winter, is a recreation of Agatha Christie’s most famous poser, Murder on the Orient Express. Yes, a murder mystery train experience with all the luxury, swagger and verve you’d expect from such a distinguished setting. Now the problem is that the Orient Express doesn’t actually do this kind of experience – I suppose having done the original with Hercule himself, they thought they couldn’t top that. But the good news is that The British Pullman, sister train to the Venice Simplon-Orient-Express plays host to its very own murder mystery days, with five course gourmet lunch thrown in. There’s just the one experience, offered by the different providers, and prices do vary, so just choose the cheapest. We pick up the very latest prices, so any offers will be reflected here straight away. So what happens on this murder train day? You enjoy a round trip on this legendary train from Victoria in London through the stunning Kent countryside, savour some of the best food that money can buy, and are presented with a professionally presented “murder” to solve. It’s a full day trip, with the train journey lasting some five hours, so there’s plenty of time to get to know the imposing luxurious train itself, your fellow sleuths and the murderer/victim as well as to join in solving the clues and bringing the villain to justice. Needless to say, it’s a dressy occasion, so leave your jeans and trainers at home and come as smart as you like. And of course it’s not one of the cheapest detective experiences you can buy. But then in this case we’re confident that you get what you pay for. As a Christmas present with a difference for that special someone, book a ticket for two and surprise them. Or simply treat yourself and get away from it all into a fantasy land for a day – you don’t really need an excuse, do you? You’ll find that there are plenty of couples go, but it’s also very popular with people on their own, and this high class train adventure is very friendly and welcoming. This is a much sought-after day with limited availability, but then things for the discerning experience-goer always are. Try it out, and don’t forget to come back and tell us how much you loved it! Murder Mystery Train Experience 5Sarah Firminon the fabulous,luxurious British Pullman, sister to the famous Orient Express.